Primary 5 are studying this topic and visited Bannockburn Centre to find out what life was like in this medieval time and to have a go at re-enacting the Battle using a virtual board. Pupils had a brilliant day in Stirling and had opportunities to try armour, clothing and to watch historic 3D film clips about the history. A ‘Water Timer’ and ‘Stationary Holder’ ‘Plant Pot’ for 🌶 and a plant growing tray for flowers and seeds. Primary 5 were given a challenge to design and create a medieval board game. They wrote background stories, created characters, designed settings and wrote instructions. We invited Primary 4 pupils to come and play the board games and to give some feedback and they really enjoyed playing the games! 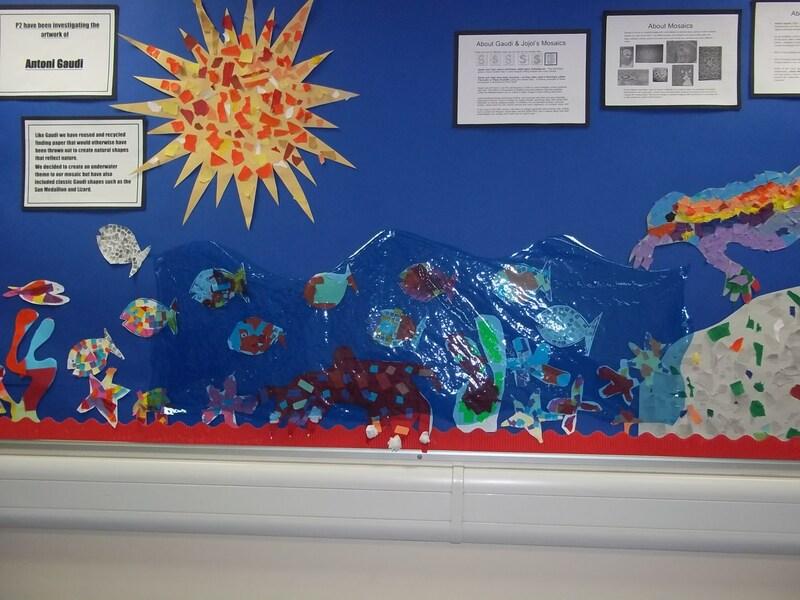 Primary 5 studied the topic Water in Science and looked at The Water Cycle. We carried out experiments in class to look at Evaporation, Condensation and Precipitation. On World Water Day we looked at Global Goal 6 of the Sustainability Development Goals and the children looked at different aspects of this such as clean water and sanitation in a carousel activity thinking about this Globally. 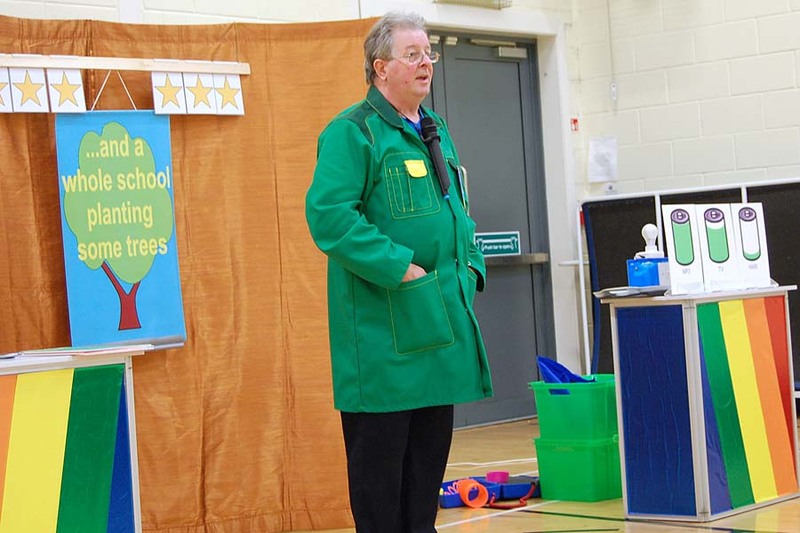 Mr Westmoreland visited us that afternoon to talk about the ‘poop cycle’ and how sewage systems in Scotland work. Primary 5 have been studying Endangered Animals in our topic and we learned about the different categories of Endangered species and what the main threats to species are. We researched animals and looked at ways we can help save or protect a species. 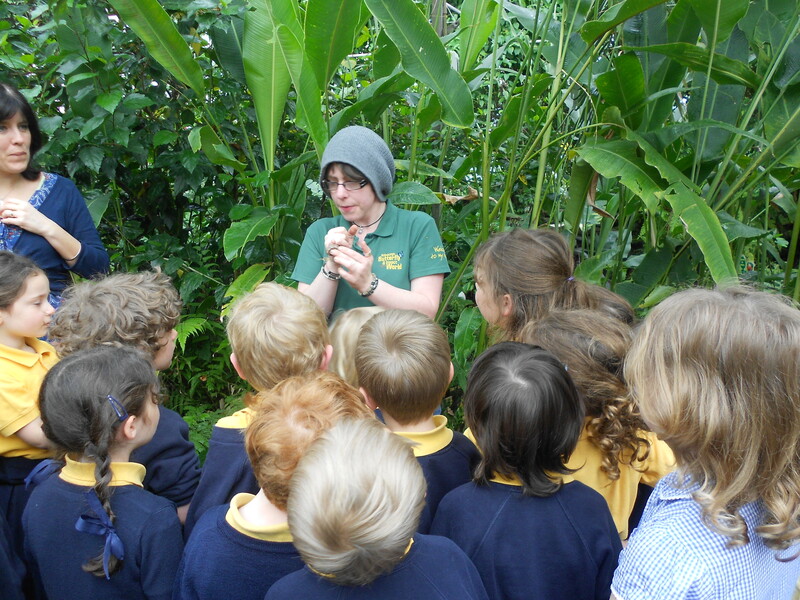 We visited Edinburgh Zoo for a workshop on Endangered Animals. We ate our lunch beside the Chimpanzees and visited the Koalas whilst also getting up close to the tiger. Primary 5B also delivered an informed assembly to the whole school and shared their learning using a creative approach. Today Primary 4 went to Largs to visit Vikingar. We explored the Longhouse and found out about everyday life and the Norse Gods. We were able to dress up as Vikings, not just the warriors but farmers, wordsmiths and traders. We also found out about the Viking settlers in Scotland and the Battle of Largs. It was a great day enjoyed by everyone. This term we are learning about Vikings. We are doing lots of research about how they lived. Here are some of the questions we have been asking and some of our artwork. Primary 4 visited the Museum on the Mound today, we had a very enjoyable trip and learned lots about money and even got the chance to see a million pounds. Primary 4 have had lots of festive fun at their Christmas party today. We sang Christmas songs and carols under the tree which was lovely and we are all now ready for Christmas. Here is a video of one of our songs. P4 have had a very busy term. Our topic has been Edinburgh and we had a fantastic visit to Edinburgh Castle. Cameron became a Knight and wore his suit of armour with pride. We have been learning the Ukulele on a Tuesday morning and we are able to play recognisable songs now. Wait until our sessions are finished. Look out Britain’s got Talent. 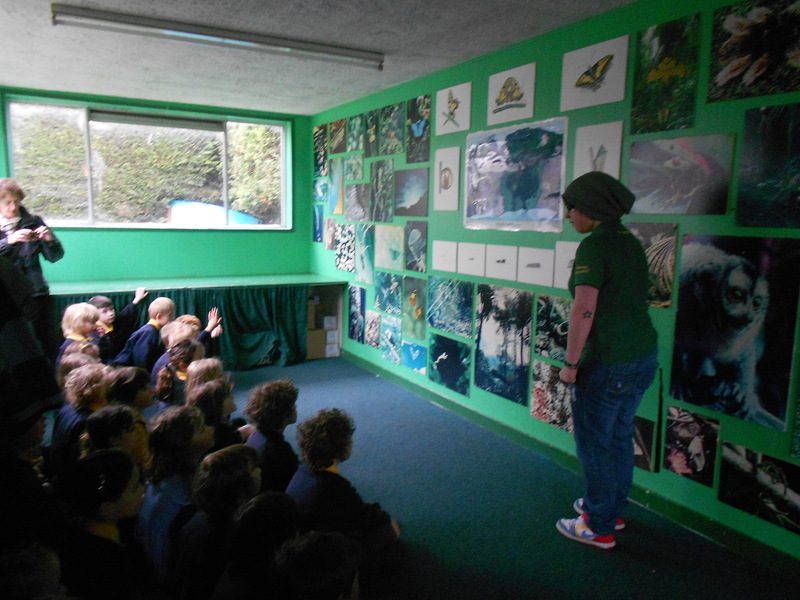 We have been visited in school by RSPB who told us how important it is for us to maintain and make new habitats for our wildlife. We explored our garden and discovered that it was easy to give nature a hand. On Thursday we visited the Internatioinal Book Fair in Charlotte Sq and met with the Author Steve Webb and the Illustrator Chris Mould who talked about their new book Spangles McNasty and the Fish of Gold. Cameron was lucky enough to join Steve on stage to help with a song. After the show Grace, Ruby and Oliver had a private meeting with the duo and interviewed them for CBBC. 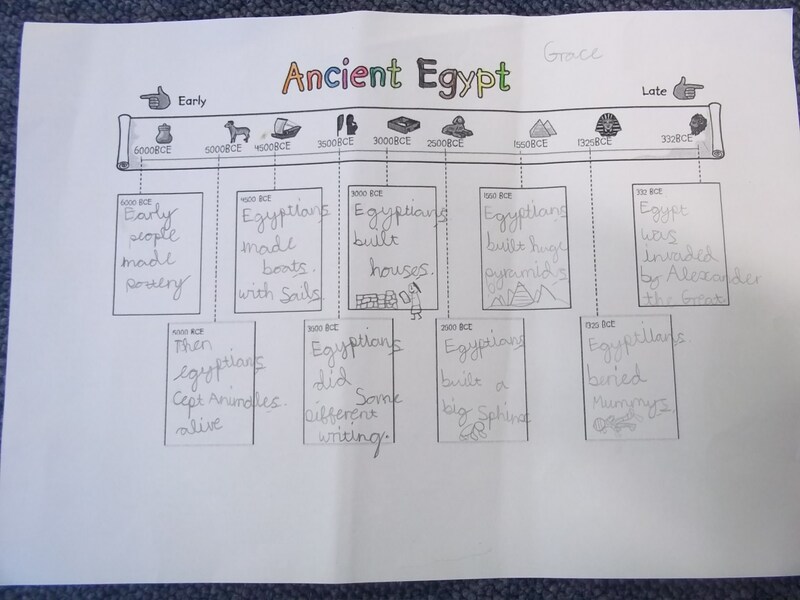 Primary 3 have been learning all about Ancient Egypt. We have travelled back in time, past lots of different important historical events (take a look at our class timeline display below) until we landed in the year 6000BC! It was very exciting. Primary 3 have also become very good at using an atlas to find out about Egypt. We can spot it on a world map because we know that it is part of the continent of Africa and it is in the north. Egypt also has a very important river running all the way through it. We have even looked at Egypt from a satellite in space! There are lots of different reasons why the River Nile was important to the ancient egyptians. It is so important Egypt has even been called ‘The Gift of the Nile’. Can you think of any reasons why the Ancient Egyptian people depended on the river? Next stop on our learning journey, we are going to do some research on farming in Ancient Egypt. Watch this space for more information. During Health Week Primary Two enjoyed the “Wake and Shake” sessions outside. We have carried on with our “Wake and Shake” sessions each morning inside the class to keep us healthy and active! 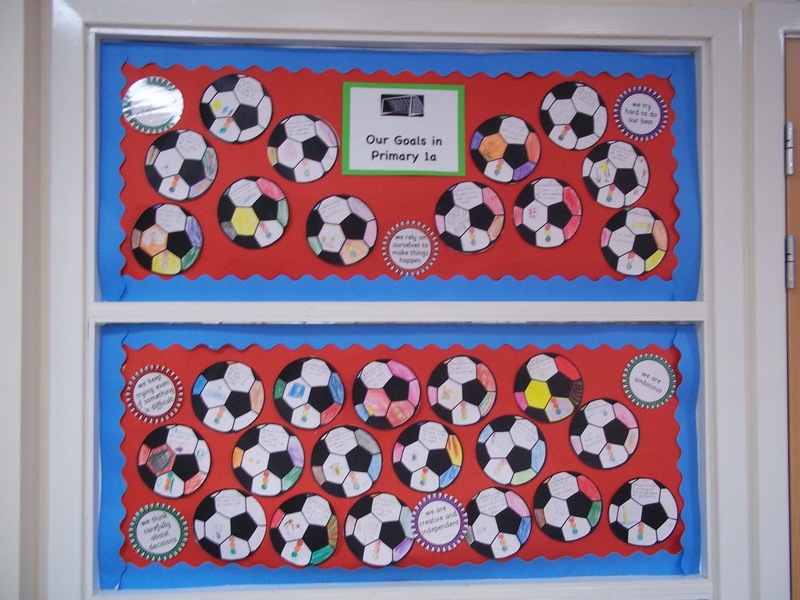 Primary Two also enjoyed footbal,. 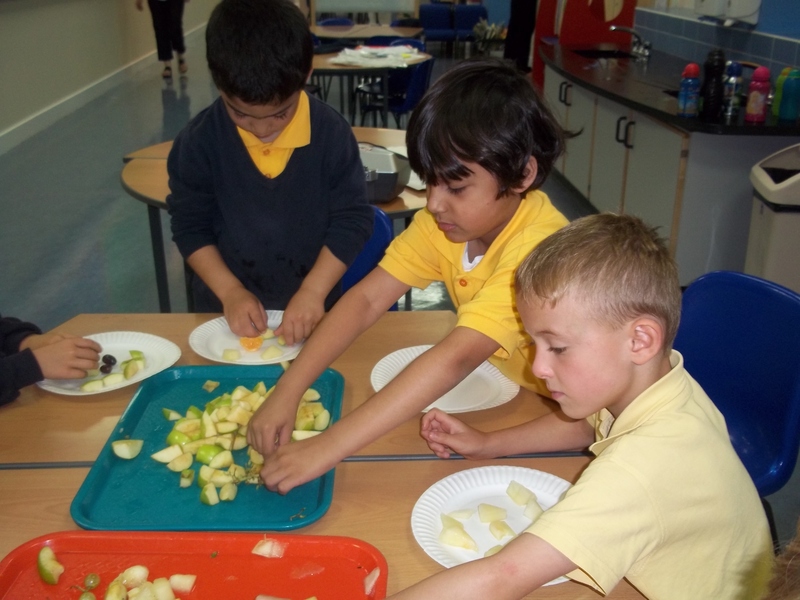 yoga and making fruit kebabs and fruit faces with the Primary Seven pupils. Primary Two studied Gaudi and we looked at some of his mosaics and created some of his designs and used re-cycled materials to make our own mosaics. Here is the display outside our classroom. 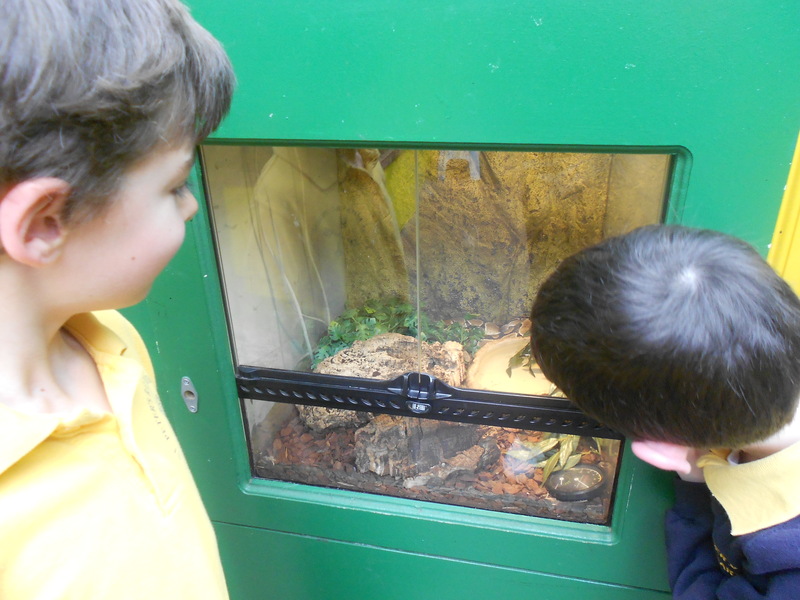 The boys and girls of Primary 1 were thrilled to go on their first school trip and Butterfly World was an instant success. The children had the opportunity to observe the life cycle of the butterfly at first hand, not just read about it in class. 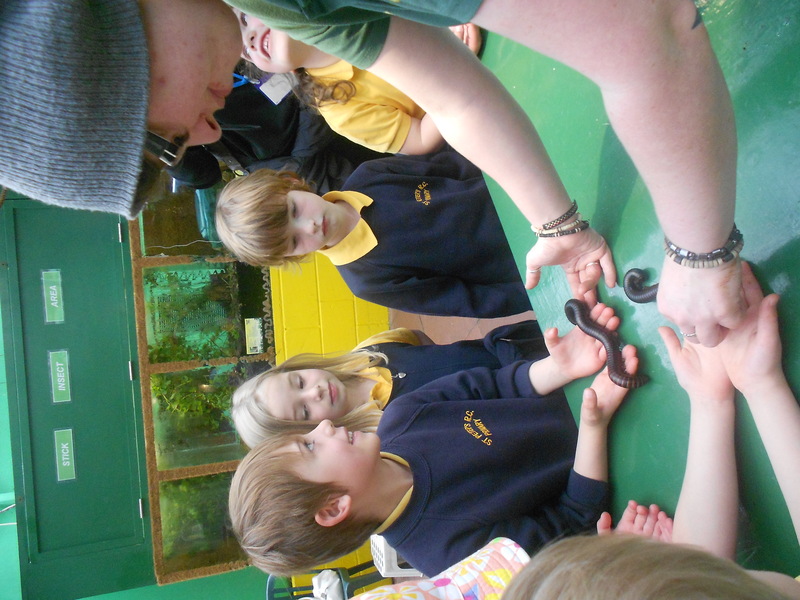 The children also enjoyed handling the creepy crawlies, not afraid at all! Niamh from 1b even said, “The Tarantula felt like she was wearing little sock!” The reports the children wrote after the trip were very well detailed but most importantly, reflected fun they had. 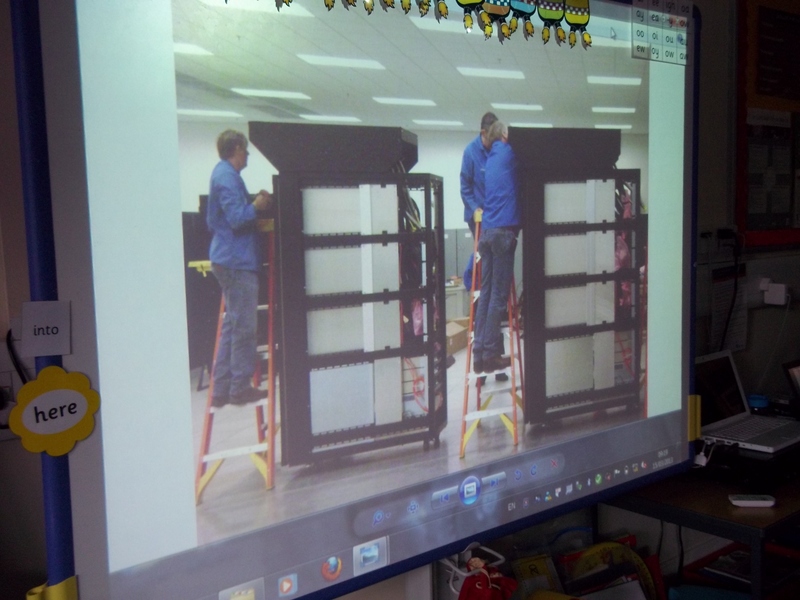 To start off Science Week we were visited by a parent who told us all about building a Super Computer. He showed us how big it was and what it was able to do. It was very interesting. In P1 we learned all about money and how important it is to save. Mrs Riach came into class to talk to us. This year we have set ourselves goals and are trying hard to achieve them. Some of us want to get better at writing or to sit still on the carpet and be good listeners. We also want to be better at gymnastics and at games. Primary 1 have settled very well into St Peter’s. The children have become familiar with all the faces around the school. Through the ‘At School’ topic, children have had the opportunity to identify what they would like to know about starting school. The children have enjoyed getting to know their buddies a creating role play activities in the school corner the most. Welcome to our new Primary 1 pupils.We hope you have had a lovely summer and are looking forward to a busy and exciting year ahead. Health week begins 27th August where there will be lots of activities and morning aerobics! All the children in P1 have enjoyed training for and participating in the school’s Olympic Themed Sports Days that took place on the 13th and 14th of June. We were very lucky with the weather both days. The children were happy to be part of a “different” country for the opening and closing ceremony and worked well with children from all stages of the school preparing for this. Many also talked with great enthusiasm about seeing the real Olympic torch in Morningside/Bruntsfield on the Wednesday. Many had photos to show and this is something they will remember for a long time. Everyone also had a good time at our picnic in the park event and many parents and families turned up to support us. Overall it was a fabulous two days and a super way to end their first year at St Peter’s. Special thanks to Mrs Walker our P.E. Teacher for arranging all of this. 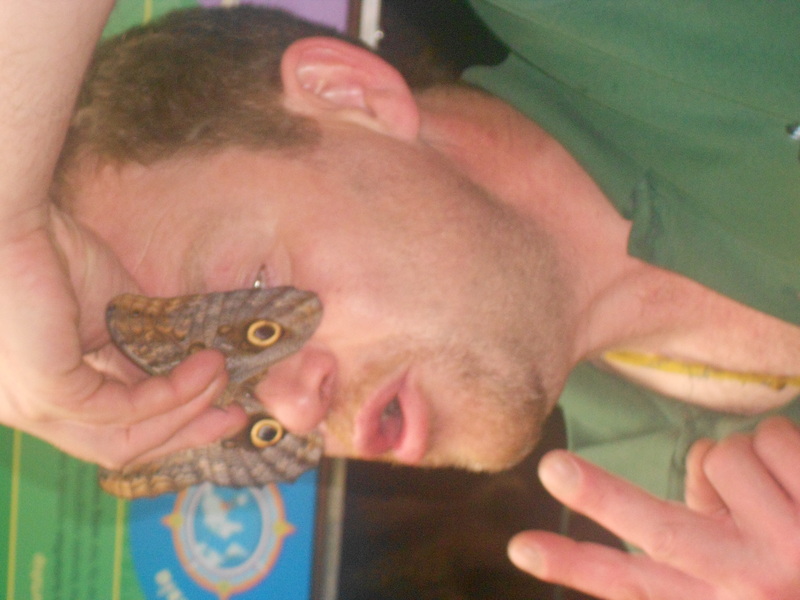 Everyone enjoyed their trip to the Butterfly and Insect World on the 11th May. 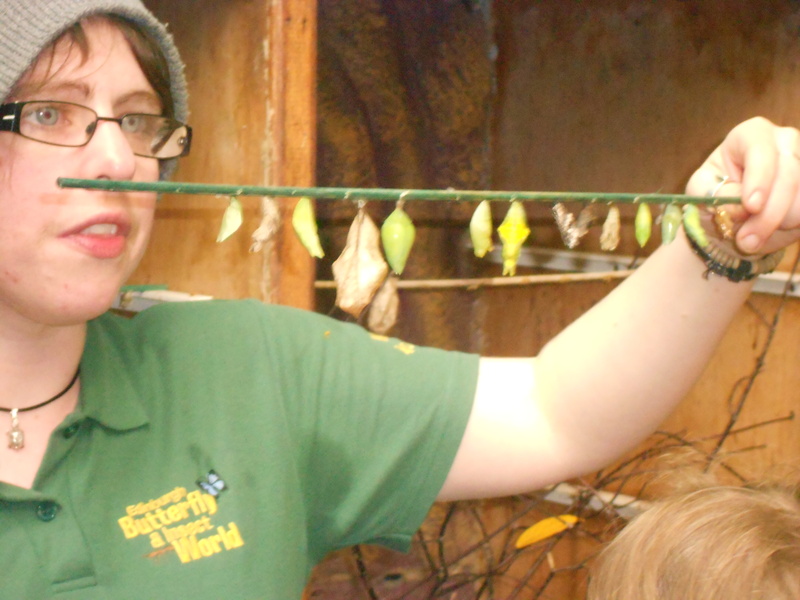 The children were very excited to see all the beautiful butterflies fluttering around as well as hold a variety of creatures including snakes, millipedes and tarantula spiders. SCIAF fun run: The whole school took part in a fun run for SCIAF. Everyone dressed up. 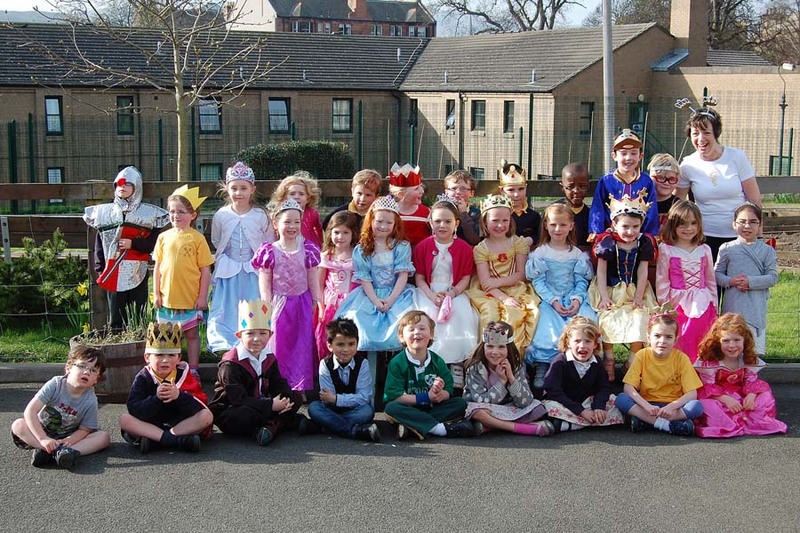 The theme was Kings and Queens and we had some wonderful kings, queens, princes and princesses. 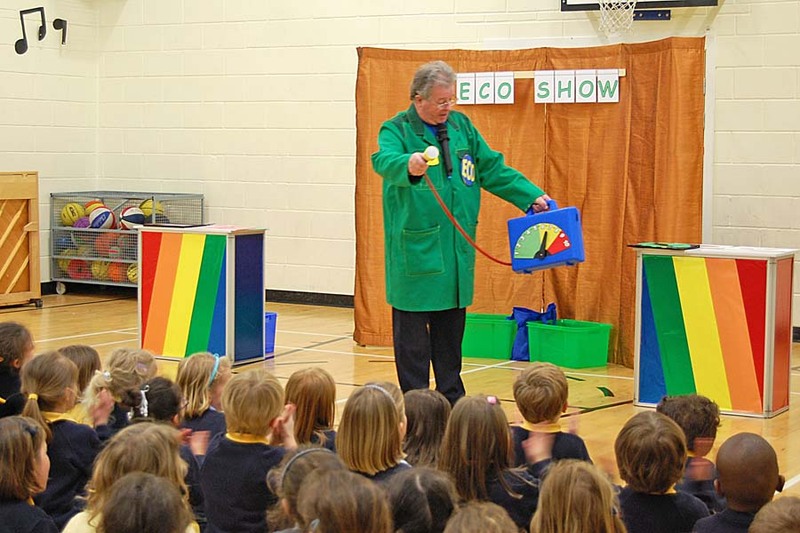 Eco Road Show: Primary 1-3 enjoyed a visit from Professor Eco and his road show. 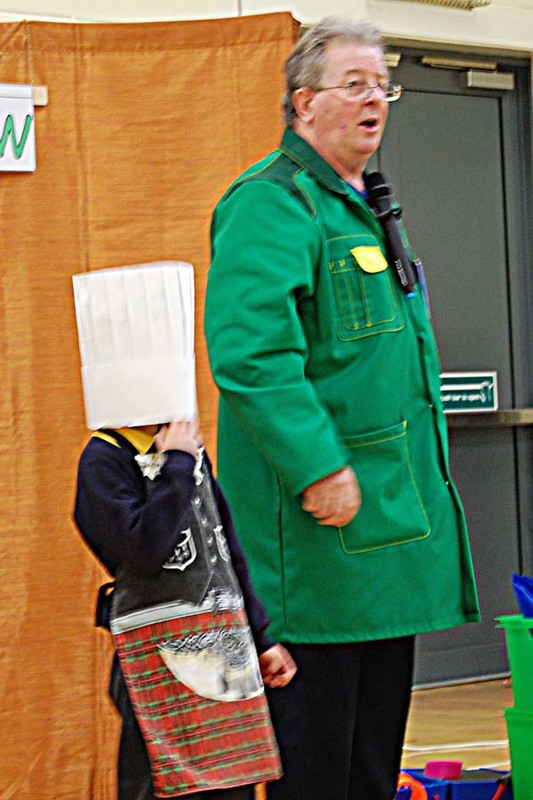 He was teaching the children about different ways to look after ourselves and out planet. 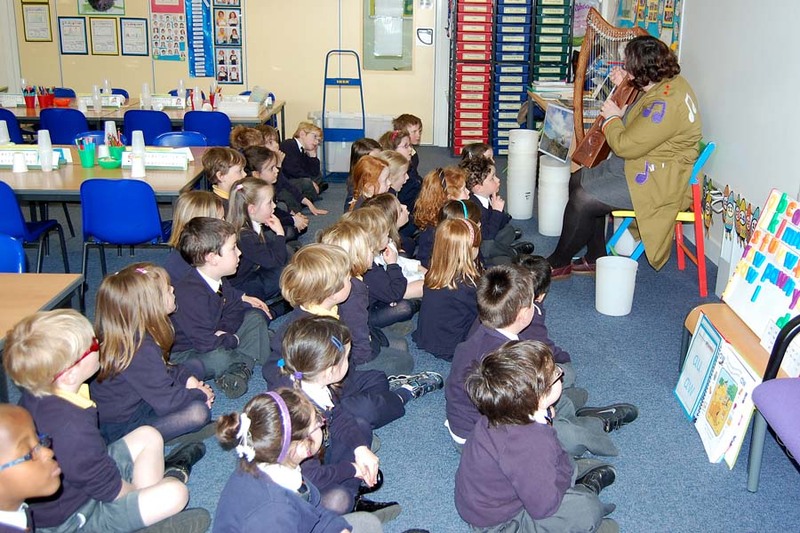 This included a variety of songs, games and quizzes that help to teach them about things such as not dropping litter, eating healthily and different ways to come to school including walking and cycling. 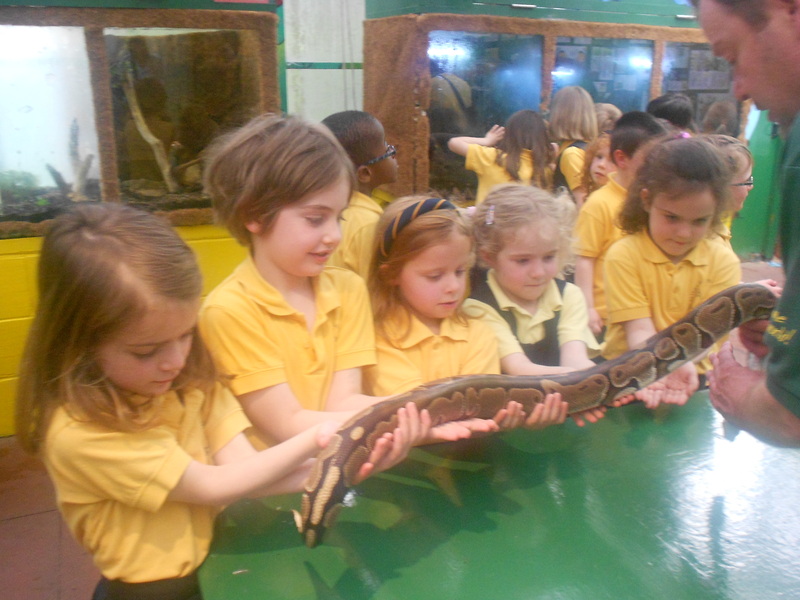 Learning in Context: The children thoroughly enjoyed their last topic. It was on different types of Energy including heat, light and sound. 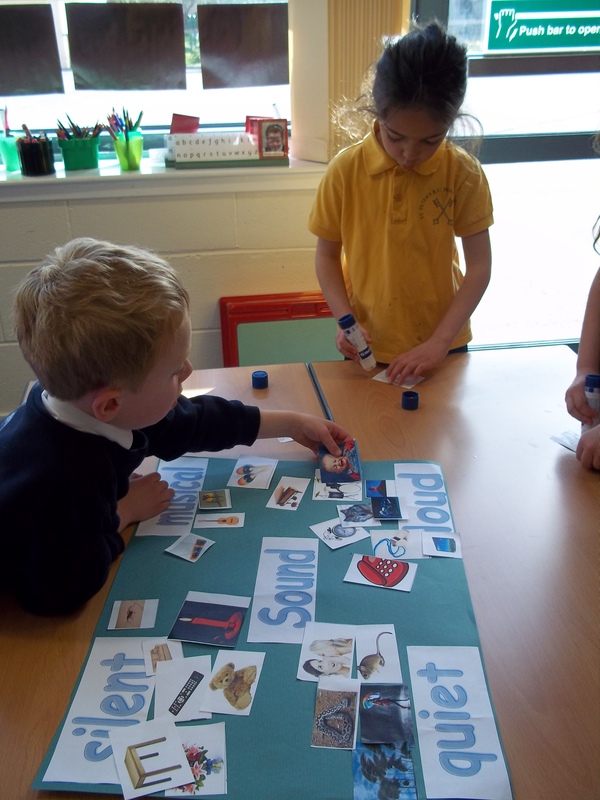 One of the activities the children were involved in was working as part of a group to design a poster showing different types of sound. 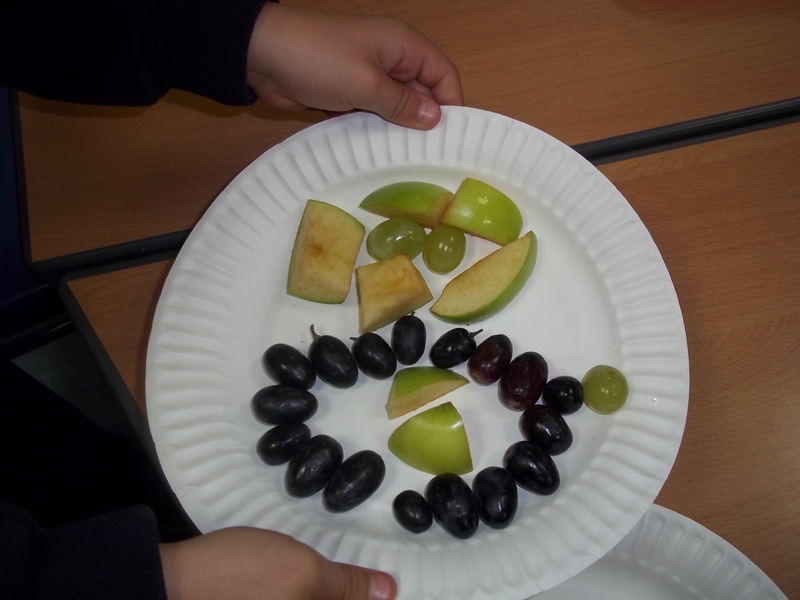 This enabled the children to display their good communication and co-operative skills. Our new topic this term is Living Things. We have set up a role play garden centre outside the P1 classrooms and the children have created some wonderful art work in the style of Vincent Van Gogh’s Sunflowers. Achievements at Home: The children absolutely love coming into school and sharing news of their newest talents such as dancing, learning a different language or playing an instrument. All primary 1 children have been busy during their P.E. lessons both with Mrs Walker (our P.E Teacher) and with their Class Teachers. 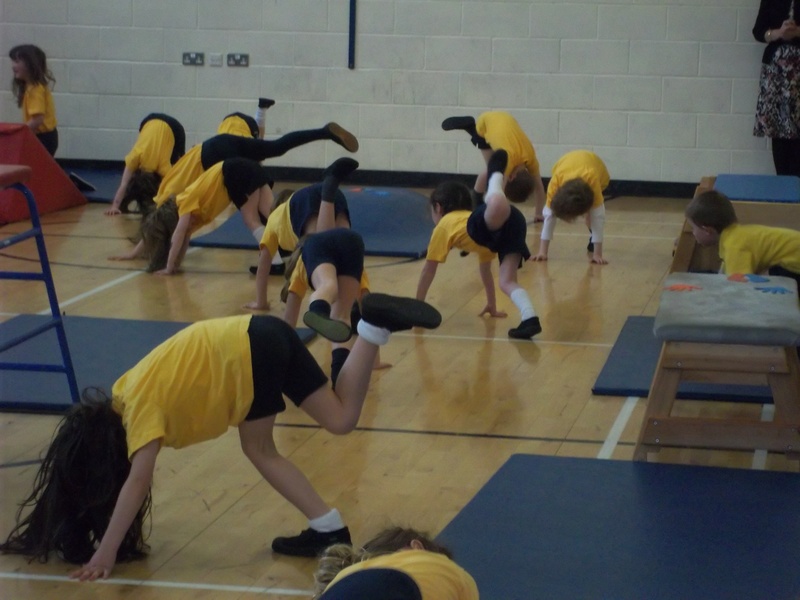 They have been learning a range of gymnastic skills including balancing, rolling, stretching, and climbing. We continue with our daily literacy lessons and this term we have been learning lots of new sounds including wh, th, sh, ch, ai, ay, ea, ee, igh and -y and using these to help us become independent writers. We are working hard to improve our handwriting too. We have been learning how to do addition sums using different strategies including, using a number line, counters, our fingers and remembering facts. We have even learned how to use a calculator to check our sums. We have also been learning all about time including telling the time on the hour and being able to sequence activities in our day. This term we have been learning all about different materials. We have been discovering what different things are made of and discussing why we think it is a good material for a particular purpose. The children have been learning how to use a variety of words to describe materials by their look and touch. Another part of our topic is to develop the story of the Three Little pigs. We have look at several different versions, experimented with the different materials each pig used and created drawings of each house in ICT using clicker paint. The children have also been developing the story though music and drama. Finally we hope to ask all children to create a puppet during the February break using a variety of materials that they can then bring into school to share with others. Primary 1 are happy to be back at school and are going to be learning about Materials. 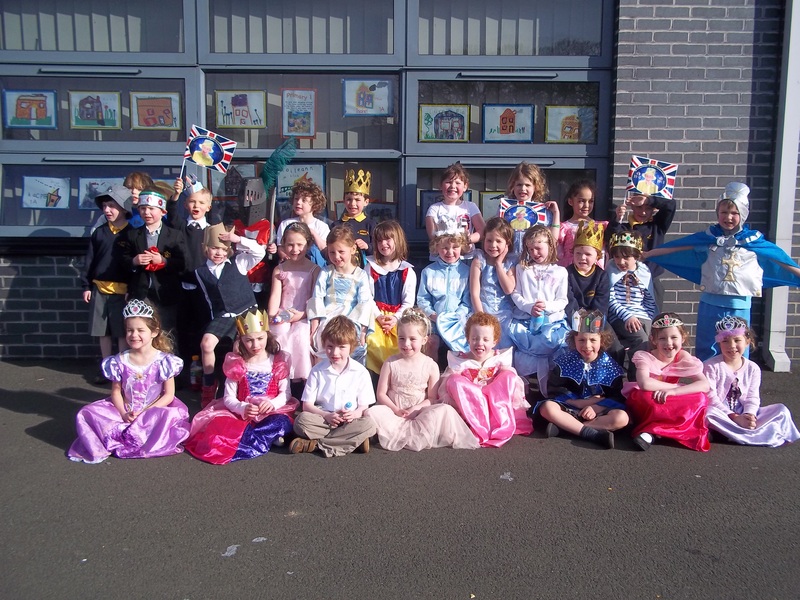 Primary 1 had a very busy time doing their nativity play with the Primary 2 classes. The choir had to learn all the songs, the actors had to learn all their words, the narrators had to memorise their lines and the band worked on their percussion. Everything came together really well and the children perfomed beautifully on the the 13th of December (in the morning for the whole school and in the afternoon for all their families. 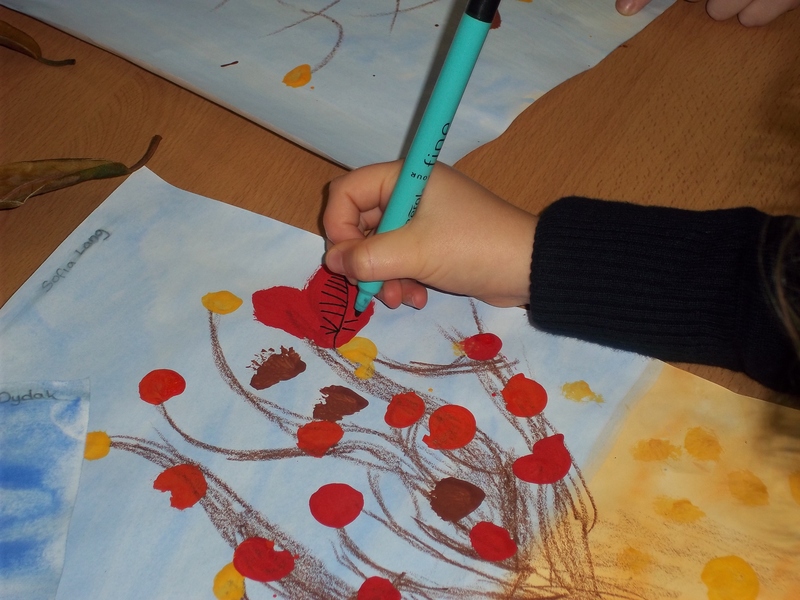 Primary 1 have been working on the topic of Autumn this term. They have been involved in a variety of activities including singing Autumn songs with Mrs Turnbull, creating Autumn pictures, sorting leaves by a variety of different criteria, using the clicker paint programme to create Autumn leaves and identifying changes in weather. Another particularly enjoyable experience was a homework challenge. Each child was asked to create a 3D model of a home for an animal such as a squirrel, hedgehog or badger. They had to show their knowledge of the topic by creating a home that was fit for purpose e.g. it had to be camouflaged from other animals and cosy for the animal to hibernate in during the winter. The children were all very excited when they brought them in and were keen to share them with other children in the class as well as other children in the school. 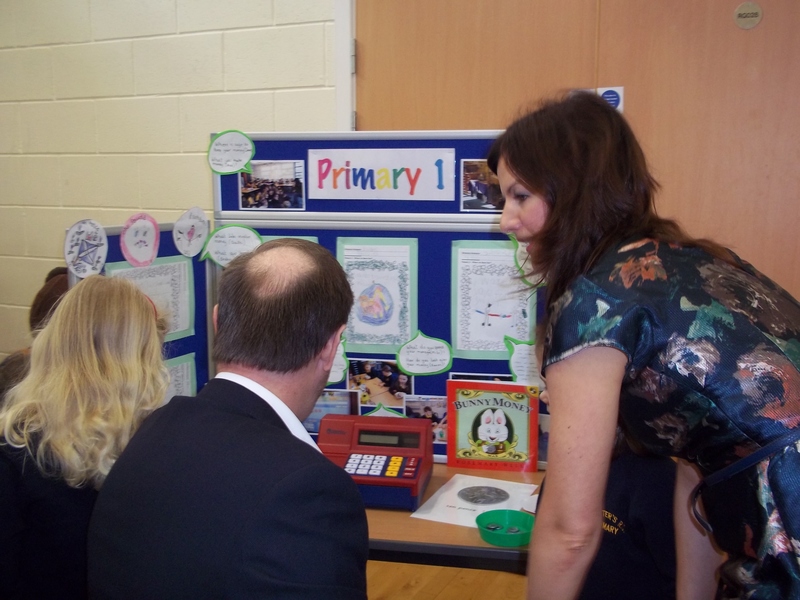 All Primary 1 children participated enthusiastically in our health week activities. Everyone enjoyed our daily outdoor workouts first thing each morning and this set them up for a busy morning ahead. On Wednesday both classes took part in an Enjoy-A-Ball session led by Alasdair (the coach). The children were able to display a range of ball skills including bouncing, throwing and catching. On Friday each class participated in a modern dance session led by Kayleigh (the dance teacher). Again all children were fully involved in learning a variety of steps and putting this together to form a short routine. 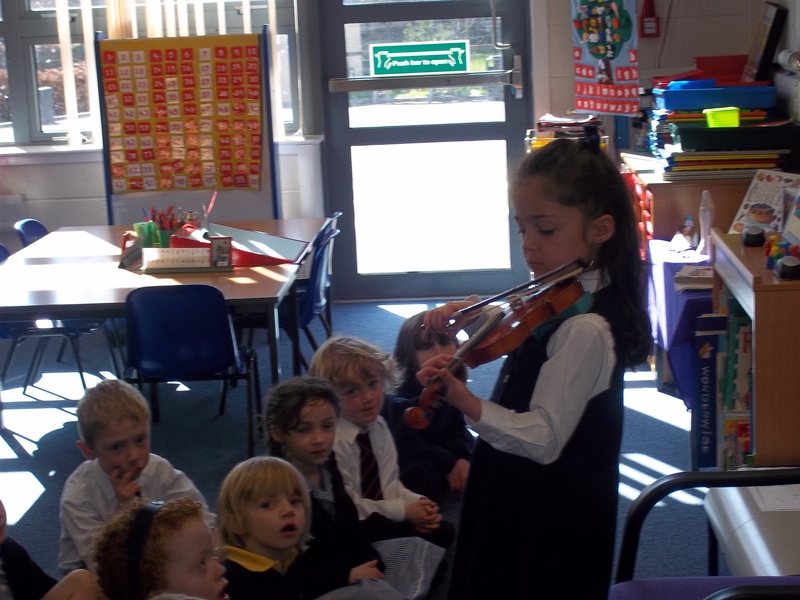 The children displayed confidence and excellent listening skills during this session. Each day in class the children would join in a dancing and fitness session to songs such as the Funky Monkey and Old McDonald. 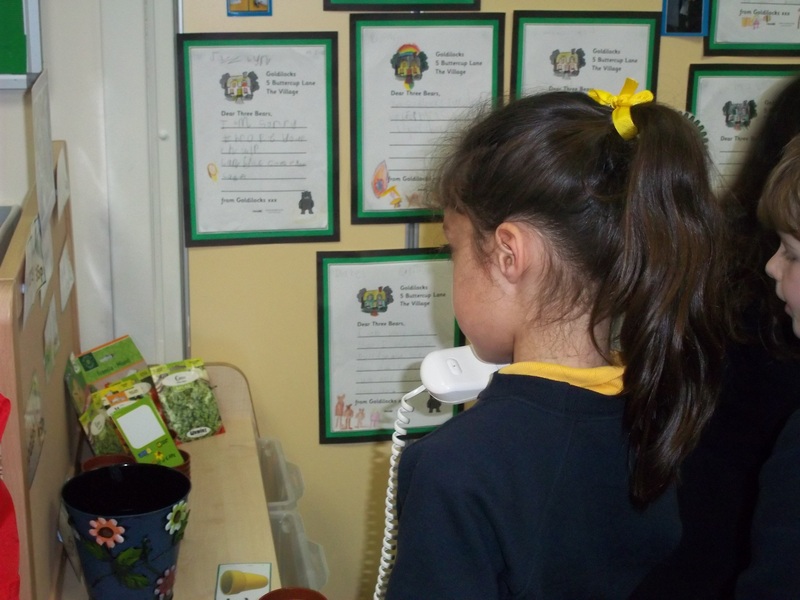 As well as these activities the children in both classes had the opportunity to display their knowledge about where fruit and vegetables grow (underground, above ground etc) by using an interactive whiteboard activity.